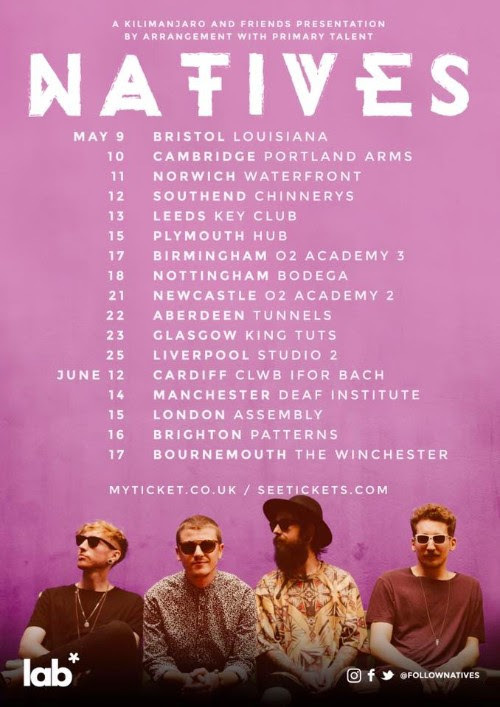 New Forest tribal-pop quartet Natives have announced an extensive 17-date UK tour running throughout May and June this year. The tour starts at the Bristol’s Louisiana on May 9th and finishes at The Winchester, Bournemouth on June 17th. The band will call at major cities across the UK and headline The Camden Assembly, London on June 15th. The announcement follows the band’s recent tour with Busted, which saw Natives play the biggest shows of their career and achieve high profile press support from the Evening Standard, Metro and more. The band are gearing up to release their second album later this year through LAB Records / The Santi Collective. The recent string of highly acclaimed single releases, including ‘Warpaint’, ‘Passion’, ‘Stop The Rain’ and ‘Chasing Lions’, from Natives give a taste of the ambitious record, which explores the fictional story of a curious character who embarks on a journey into an unknown world.